Aya Krisht is a graphic designer and illustrator based in Dearborn, MI. A graduate of the American University of Beirut (AUB) with a B.F.A in graphic design, she is currently the Media Designer at the Arab American National Museum where she handles all of the print and digital visual applications of the Museum and its events and projects. She has a strong interest in comics and the relationship between comics and design, which was the subject of her thesis at AUB, as well as film and the creative intricacies of storytelling and visual narrative in both film and comics. In conjunction with Drawing in the Diaspora: Comic Art & Graphic Novels by Leila Abdelrazaq, AANM presents a talk on design in comics led by graphic designer Aya Krisht. Comics often goes unrecognized as the highly expressive medium that it is, one that harnesses the dynamism of graphic design to transform art and story into a unified language. This talk will explore examples of work from a diverse selection of creators to provide an in-depth look at how design elements and practices used to convey mood, meaning and message all come together in comics, creating a graphic language and unique form of expression that in equal capacity shows and tells a story. Habibi by Craig Thompson. 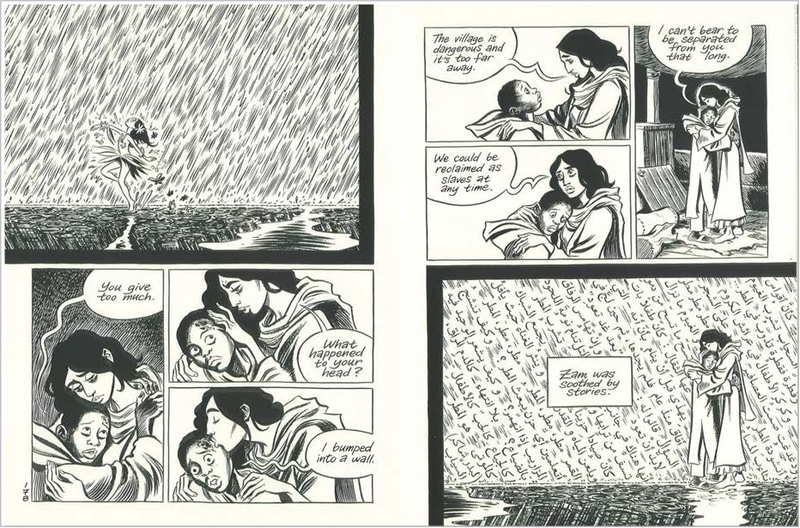 These comic pages are designed with a reflective layout to draw a comparison between the past and the present, using Arabic text (bottom right) to parallel rain (top left) both visually and thematically, as both elements represent something comforting and alleviating.